Felwine Sarr co-founded Editions Jimsaan in 2012. His co-founders are Boubacar Boris Diop and Nafissatou Dia Diouf, both leading figures in the Senegalese cultural scene. Alongside Jimsaan, which seeks to showcase new writing and republish lost classics such as Malick Fall’s La Plaie, these three writers have also recently taken the reins at the Athéna bookshop in Dakar. Felwine Sarr has published two novels, Dahij and 105 rue Carnot and a collection of reflective prose entitled Méditations africaines. He also finds time to teach economics and management at the université Gaston Berger in Saint-Louis, Senegal. Our conversation took place at the Athéna bookshop in July this year. RB: How did your project to create a publishing house and bookshop begin? FS: What happened first was that, following our cultural and literary ambitions, Boubacar Boris Diop, Nafissatou Dia Diouf and I created a publishing house called Jimsaan, We had planned to open a bookshop in Saint-Louis at a later date and we thought starting with a publishing house would be simpler. But we had a conversation with the former owner of Athéna, this bookshop in Dakar where we are today, who told us she was thinking of selling up. We already knew this bookshop, we were already organising literary debates here and we saw it was a good opportunity. We said we wanted to start with publishing, but decided to take the plunge. Dakar is an interesting city in terms of art, and we wanted to make this more than a bookshop – to create a place for debate and the circulation of ideas. So that’s how the adventure of Jimsaan, and then Athéna bookshop, with Nafissatou Diouf and Boubacar Boris Diop began. RB: What is the meaning of Jimsaan? FS: Jimsaan is the name of a rizière, a place where rice grows in the Saloum islands, in the Serer region. So there is this idea of making things grow. It’s a proper noun, in Serer, the name of a specific rizière. RB: How did this writers’ collective (if you would call yourselves such) come together? FS: We were already friends and had intellectual, artistic and cultural common ground. I think that we all wanted to invest ourselves further in the cultural sphere, and more precisely in the world of books. We also wanted to take part in sparking a debate, an intellectual and cultural debate surrounding questions stirring our society. We had fewer and fewer spaces that offered the possibility for such an indepth debate. So I think naturally we came to value the project of creating a cultural space around publishing, the bookshop, and even music and film production, in the ambitions of Jimsaan. RB: What are your current projects? 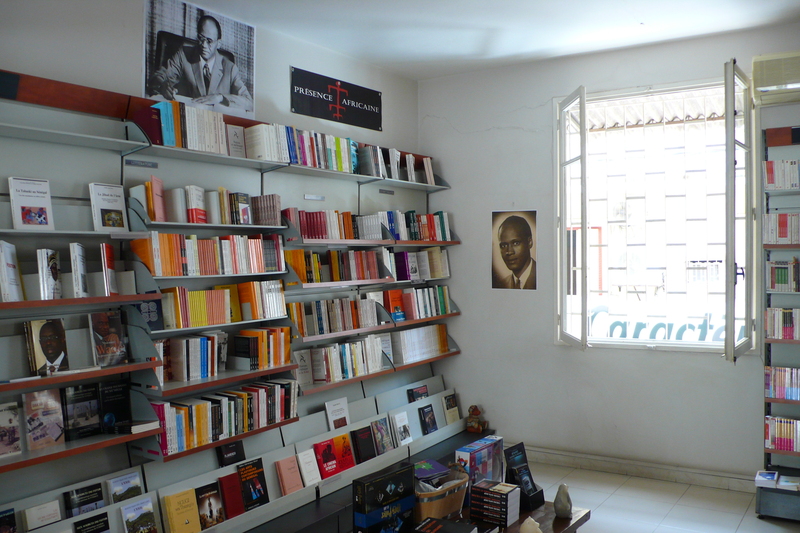 FS: To start with we want to make Athéna the go-to place for the Senegalese literary scene. This year we have had a regular programme of debates, conferences and we are starting to gain recognition as a place for exchanging ideas. That’s one objective we want to pursue. We’re also working on stocking the bookshop. We’ve secured a partnership with Présence Africaine and currently have their complete catalogue here. What you find in the rue des Ecoles in Paris, you’ll also find here. We would like the range of books on offer to reflect our outlook on the world, and not just be the standard books and bestsellers. So that someone who comes here senses there has been a process of reflection on what’s on offer. There are literatures we want to promote, that we want to make available, which we’d like to cover exhaustively. So that’s where we are now: defining an identity, a bookshop oriented towards literature we want to promote, from Africa, the Caribbean, their diasporas, from Senegal. It’s not acceptable that you arrive in Dakar and that you can’t find contemporary Senegalese and African authors in the bookshop. It’s important. In the academic sector too, since that’s where we come from, there is work to do in distributing titles in the humanities and social sciences. In the publishing house we are in the process of prospecting, of publishing young authors. 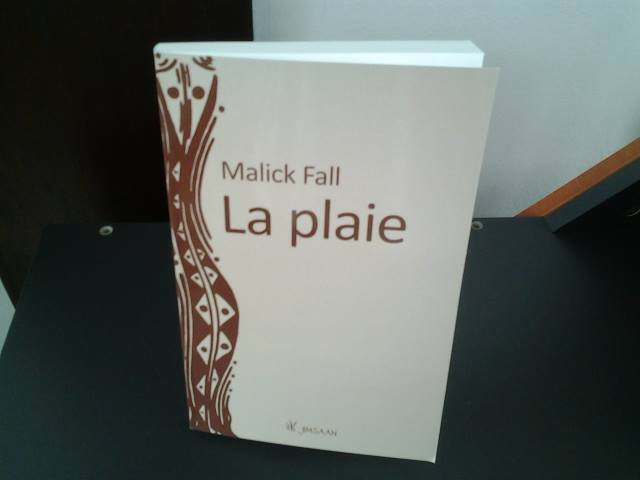 We are about to bring out a new edition of an important classic text in Senegalese literature, La Plaie by Malick Fall. We’ll bring it out in the autumn. We are also going to publish a text by Léonora Miano, the Cameroonian writer who lives in France and won the prix Fémina. That will also come out in the autumn. RB: Is that an unpublished text? FS: Yes, completely new. It’s a novel called Cantate de la mer Noire. RB: And how did the project of republishing Malick Fall’s “lost classic” arise? FS: We started the publishing house in Saint Louis, and since Malick Fall was from Saint-Louis, and the novel takes place there, we realised it didn’t have the recognition it deserved. Not many people know this book, but it’s an important text. So we thought it would be a very good idea to start a publishing house founded in Saint Louis by republishing that text. It’s a book about marginality; with a discourse on colonialism. It’s written in very beautiful language. The rights had come back to the family, so we approached them. There will be a preface by a lecturer at the Université Cheikh Anta Diop, Alioune Diané. RB: Can you describe the editorial work on Malick Fall’s text? FS: We’re working on the cover art now. The preface and text are ready. It was a lot of work. There were little mistakes, syntactical errors, some typos, some strange words we couldn’t find in any dictionaries. For example, the south island in Saint-Louis is Sindone, not Sine. We’re certain it’s the publisher who didn’t understand. We’re sure he meant Sindone you see. There isn’t a manuscript. We took the two different published versions, retyped them entirely and made comparisons. It was painstaking work, retyping, rereading. His family were very supportive – the book would be out of print otherwise. RB: What were the precedents of the Jimsaan/Athéna project? 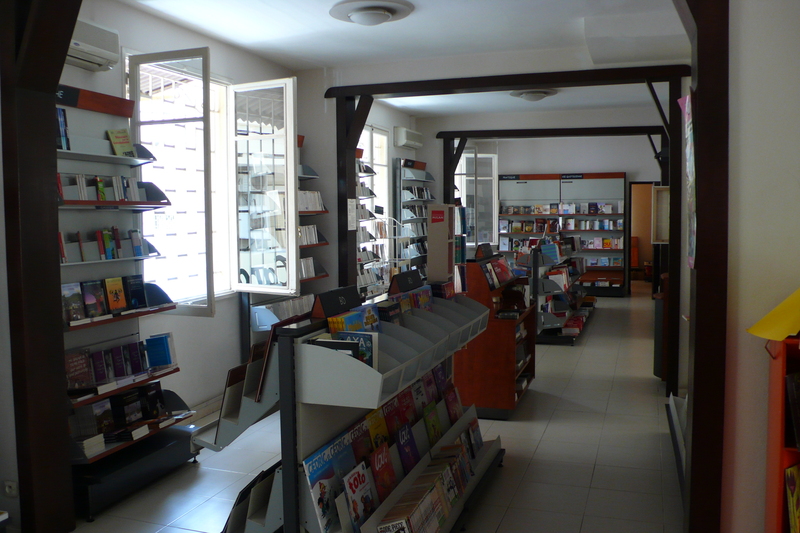 FS: There are lots of publishing houses in Dakar. The fact of creating a publishing house is not such a ground-breaking feat, but the innovation comes in the ambition to make a publishing house that people turn to: to be demanding with the content and quality of texts. To have an approach that people identify as producing quality publishing from the continent. And I think that if we do this, if Souleymane Bachir Diagne, our first author, (we published last year Comment Philosopher en Islam) and Léonora Miano entrust us with their texts, then other good authors will come, and will discover that there are new voices. There is a will to participate in building up good African literature. Often people publish elsewhere because they don’t find suitable publishing opportunities here. It’s not necessarily a desire to be published in Paris, it’s the desire to be published in proper conditions, with proper editorial work and distribution. The rights for most African literature in French don’t belong to us; it’s always the same process: an initial unequal exchange, which then continues and pursues us in the intellectual sphere. We don’t always have full control over aesthetic choices and orientations, and we are still in a context where forms produce a discourse about us which matches the expectations of this or that readership. So it’s important to be able to build up our own voices and I think that being in control of publishing is important. It’s from this perspective that we’re doing the work of restoring singular voices, our own voices, perspectives, desires, epistemes. This is important, and a real challenge. RB: Have you started to receive many manuscripts? FS: We receive lots! I think that the presence of Boubacar Boris Diop helps. He has a kind of literary credibility. It’s a serious and rigorous endeavour, and a demanding one. The idea is promising for many writers. RB: And what are the other structures encouraging new writing in Senegal today? FS: Honestly, I don’t know many. I know publishers who do classic publishing, but none whose approach is to say “we’re looking for new voices, new paths”. That is our principal goal. RB: And are you in contact with anglophone African publishers? I’m thinking of the importance of the Caine Prize, or structures such as Kwani? in Kenya. FS: Yes. As well as new voices, and new editions of classic texts like Malick Fall’s novel, we’re planning to establish bridges with African literature in English, Portuguese and Spanish, by publishing translations. We want to translate works, African texts in English or Portuguese, into French. To work also with publishers who will translate our texts into English. There are many African texts which we don’t have access to, because of not knowing the language, but when we read these texts we feel at home. There is only the linguistic universe which changes – we recognize ourselves in the references. RB: Which books would you like to translate? FS: At the moment we’re concentrating on Malick Fall and Léonora Miano, and looking out for texts which could be of interest. We’re building up our contacts. RB: In anglophone Africa, journals, and e-zines, such as Chimurenga or Kwani? have become significant vehicles for new writing. Are there equivalents in francophone Africa? FS: No. I think there’s a void in that sense. A void that needs to be filled quickly. They are projects that can be sources of inspiration, but I can’t see any equivalent here. RS: So who are the new literary voices you mentioned? FS: There are many. In Gabon, there’s Janis Otsiemi, and in Senegal, Nafissatou Dia Diouf is a confirmed voice. Mbougar Sarr (who won the RFI prize for short stories) and Rama Salla Dieng are promising writers. But there is the need for more exploratory work and more spaces for people to express themselves. RB: Do you follow any literary blogs? FS: Not really. Salla Dieng had a blog, and then afterwards she published a novel with Présence Africaine, called La Dernière Lettre (2008), then she published some other texts, and short stories. I follow her work. But there aren’t many literary blogs here. There are political blogs, but very few on literature. RB: Can we see Athéna and Jimsaan as a kind of cultural and political engagement? FS: Absolutely. I think that deep political engagement is a cultural engagement. I think that committing from a creative impulse is sometimes more productive in the long-term, since you are working on people’s inner lives, on their content and existence. Politics is about context, the environment, and spaces in which we live together. But there are the conditions of existence, and there is existence in itself. And I think that sometimes commitment to existence in itself is much more important. RB: Are you entirely independent or do you have links with larger institutional bodies? RB: What about the Direction du Livre [Senegalese government body] or the Organisation internationale de la Francophonie? FS: Not yet. The Direction du Livre has a fund for publishers, but we will wait until we have published a more substantial catalogue before soliciting any aid. In the past, there has been a practice here, whereby people created publishing houses in order to benefit from that fund. So now things are better organised. But we’re waiting to exist, to know what we want to do, to show our voice and who we are, before entering into that kind of sponsorship. For now we are in a radical position. We really want to produce our own books by ourselves. The question of financing written work is very important: those who pay, also give the direction. So we want to exist in ourselves, and if we want to pursue such projects, do so in a more horizontal manner. That’s our offer: if you’re interested in supporting this project, then yes… but we don’t want to be financed, and be constrained, because the money comes from other horizons. RB: And what plans do you have to use online options for bookselling and reading? FS: Only a minority use Amazon in Senegal. You need a bank card, an account and a card, so it’s a certain category of the population. It’s not widespread. Academics buy books on Amazon. We are thinking of launching an online bookshop at a later stage. We would like our books to be available online, with suitable methods of payment. For the bookshop to be dematerialised. RB: Are you involved with the Nouvelles éditions numérique d’Afrique? FS: Yes, I know them. They contacted us and we’re in discussions. They have a very good project. A gateway for Africa and a good strategy for increasing our visibility. E-books are really an important direction for us. We think it’s a bridge we have to cross, and that we need to do so from the outset. RB: You are also a published author. Could you tell me about your own writing and how you found your first publisher? FS: I’ve been writing for a long time. Since I was a teenager. I write poetry, aphorisms, and short stories. I always knew that writing would be an important part of my existence, but I started by producing music; playing music, producing records, playing with groups. At the end of my education, when I decided to come back to Senegal, I decided that given the state of publishing here, it would be much simpler to try and find a publisher over there, before coming back. So I sent my first text to Gallimard. I came back, and four months later they wrote to say they had accepted it and would publish Dahij (2009) in the Arpenteur collection of Gérard Bourgadier. Then I met Rodney Saint-Eloi, a Haitian publisher living in Montreal. We because friends and I sent him a collection of short stories which he published in his publishing house, Mémoire d’encrier. That enabled me to go towards other interesting spaces in north America. He published 105 rue Carnot (2011) and Méditations africaines (2012). RB: And lastly, what are you reading at the moment? FS: Lots of things! I’m reading the theatre of Aimé Césaire, which I hadn’t looked at closely enough before now. I’m also reading Valentin Mudimbe’s L’Odeur du père; rereading Pascal Quignard; Americanah by Chimamanda Ngozi Adichie; and I’m just finishing the new biography of Tchicaya U’Tam’si by Boniface Mongo-Mboussa, Le Viol de la lune. 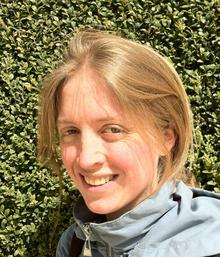 Ruth Bush is Lecturer in French at the University of Bristol. Her research interests include African literature, publishing history, and cultural studies. Her first book, Publishing Africa in French, is forthcoming with Liverpool University Press. She has also recently published a web history of New Beacon Books, the UK’s first radical black bookshop and publishing house.